What Is a DA Form 5888? DA Form 5888, Family Member Deployment Screening Sheet is a form that is used to validate family member deployment screening, and to provide the gaining command with information that will assist them in making an assignment decision. The latest version of the form - sometimes incorrectly referred to as DD Form 5888 - was released by the Department of the Army (DA) in September 2002 with August 1995 edition being obsolete. 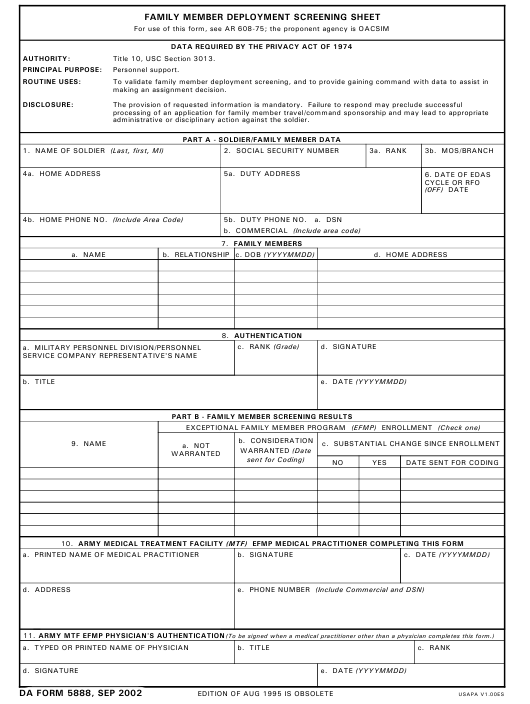 An up-to-date fillable DA Form 5888 is available for download and digital filing down below or can be found on the Army Publishing Directorate website. All dependent children of service members 72 months and younger are required to have a physical exam and a developmental screen. Physical examinations are also required for dependents over 72 months of age if there is not enough data to make a decision about the existence of a qualifying special need. Service members are asked to make the appropriate appointments with their health care providers and schedule a follow-up meeting with an Exceptional Family Member Program (EFMP) officer on their own if this examination is deemed necessary. How To Fill Out Da Form 5888? Title 10, USC Section 3013.
administrative or disciplinary action against the soldier. The form has 2 Parts and 11 Blocks in total. A Military Personnel Division (MPD) representative or a Personnel Services Battalion (PSB) representative will enter the data about the service member and their dependents after a face-to-face consultation with the service member. The Family Member's Complete Mailing Address. Family members will not be screened unless Part A of the DA 5888 has been completed and the information authenticated by the representative. Part B of the form is for the screening results of the family members. This part is completed by an EFMP practitioner at an Army Medical Treatment Facility (MTF) after discussing the special medical and educational needs of the family members with the service member. DA Form 5888 is one of the several forms that are part of the EFMP. The EFMP works with other military and civilian agencies to provide housing, medical and educational support and personnel services to military dependents with special needs. Enrollment in the program is done through MTFs. DD Form 2792-1 - Special Education/Early Intervention Summary. Enrollment is to be updated every three years (or every time there are changes in the enrollment conditions). The information provided within the forms in considered sensitive to disclosure and is only available to authorized personnel. Participation in the program does not influence the career. Family members must be medically and educationally screened and enrolled in EFMP for all service members in processing for Outside Continental United States (OCONUS) assignments. The DA Form 5888-1 is used for providing assignment instructions that later help facilitate the process.